Among several rising cybersecurity concerns, an insufficient talent pool is one of the most glaring. By 2021, there are expected to be 3.5 million unfilled cybersecurity jobs, according to Cyber Security Ventures. With hackers becoming increasingly organized and using advanced methods, having trained professionals to counter those attacks is key. We took a look at why the cybersecurity talent gap is growing and how we can all help close it. What’s causing the cybersecurity talent gap? Careers in cybersecurity are often more abstract than in other job fields. Whereas other careers have clear-cut requirements and well-defined job duties, cybersecurity has long welcomed workers of various educational and career backgrounds. Although this openness is beneficial, it also means young people deciding on careers often don’t consider cybersecurity. They may not have a clear idea of what a career in cybersecurity looks like or aren’t sure what steps to take to get a job in the field. Careers in computer science and technology are often viewed as exceptionally difficult. “Computer science” and “cybersecurity” can be intimidating words. Many people may be interested in joining these fields but feel they don’t have the knowledge and skills needed to succeed. The STEM field has long been seen as a male field. Media images, educational practices and antiquated gender norms continue to reinforce this idea. These societal ideas surrounding gender and the STEM field can turn away women who might otherwise consider a career in cybersecurity. Although the cybersecurity industry has traditionally been open to workers of various educational backgrounds, employers have recently begun seeking employees with advanced backgrounds. They want people who have degrees in computer science or security, rather than seeking people with the right personality for cybersecurity — namely, curiosity, attention to detail and a passion for learning. Naturally, this turns away even more potential employees who attend technical schools or can’t afford college degrees. How Can We Increase the Cybersecurity Talent Pool? Promote careers in cybersecurity in high school. Many young people are led to believe a four-year university is their only valid option after high school. Parents, teachers and counselors should seek to promote lesser-known careers, including cybersecurity. Trade schools, certification courses and more are also viable options, and more people would likely follow those paths if they knew more about them and the careers they can lead to. Understand that cybersecurity can be taught. Just because someone isn’t an expert now doesn’t mean they can’t be with training. Employers should keep an open mind when hiring and encourage people with nontraditional backgrounds to apply for jobs. Again, it’s important to look for people who possess soft skills that will allow them to thrive in cybersecurity jobs — such as attention to detail and a desire to learn — rather than just those who have technical knowledge. Employers should remain open to hiring people of diverse educational and career backgrounds. They should also invest in a robust program for new hires that teaches them what they need to know, makes them feel supported and encourages them to continue learning. Recruiters must broaden their engagement efforts and find new ways to reach potential cybersecurity professionals. For example, they can host cybersecurity competitions for young people and organize boot camps and open houses for people who want to learn more about working in cybersecurity. Recruiters should also visit a diversity of schools — high schools, tech schools, trade schools and more. It’s just as important to continue investing in current employees as it is finding new ones. Employers should work to keep employees updated on the newest technologies. They should encourage employees to attend conferences, promote new classes and certifications and partner with colleges, universities and other organizations to ensure employees are constantly learning. There are countless other ways to help broaden the cybersecurity talent pool. Companies, employers, cybersecurity professionals and educators all play a role. 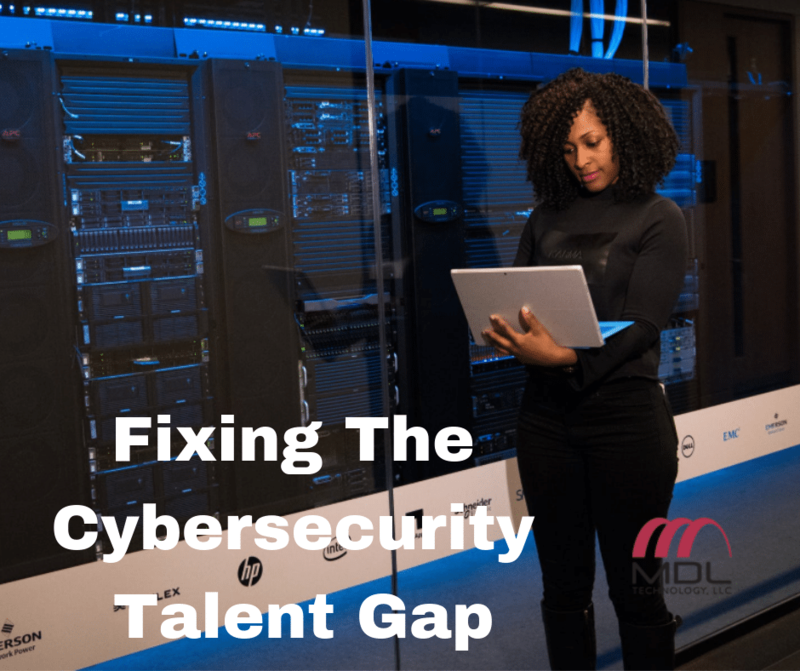 Closing the talent gap is essential to improving cybersecurity — something that affects everyone — so everyone should do what they can to increase interest in the field. If your company is looking for skilled cybersecurity professionals, contact MDL. Our employees’ combined experience means we can help with anything your business needs. Learn more about our cybersecurity options on our website.